With creativity, gumption and the right tools you can take an existing game and turn it into almost anything else you can imagine. This thread is for the discussion of hacks, mods, edits, patches, custom levels, and so on that take an existing game down a darker path. I'll showcase a few examples every now and then, but feel free to share any of your own favorites. First up is a Super Mario World hack called "Call of Cthulhu", based on the eponymous tale by H. P. Lovecraft. This game is short, consisting of six levels, though every level is unique and typically features some interesting puzzles. 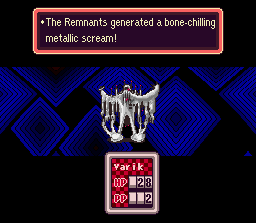 A lot of tricks and gimmicks are implemented to exhibit mind-rending Lovecraftian horror to the best of the SMW engine's abilities, and it does a pretty good job. The graphics are gorgeous, particularly the redesigned enemies, which are all wonderfully grotesque. You can download the game here, though you'll need a SNES emulator, a SMW rom, and an IPS patcher to utilize the hack. The only one I know of is that one Pokemon game where you only get one Pokemon and it's a ghost or something. I'll find it later. Once I wanted to play Mario but I didn't have a Nintendo for it and I was at a flea market. This old man I saw had Mario and a NES but the label was not there. The man said it was owned by a dead kid named Jim. I just said "whatever," because I was eager to play Mario on my new NES. I plugged it in, and everything seemed normal. I played world 1-1 and did it. Then I tried the old warp pipe trick and when I got to the pipes, and instead of the usual text that said "Welcome To The Warp Zone", it said "WELCOME TO THE SCARY HELL PLACE!" I thought that was weird. I said "whatever," and used the farthest pipe. the intro screen showed the words "DEATHWORLD 6-6-6." The graphics seemed off and it sounded like screams happened from the game. It was super scary. But I wasn't scared and kept playing. After a while I hit a place that was impossible to pass because of spikes, so I had to die. I kept trying until my lives were at zero. I thought it was game over, but Mario came back and this time it looked like his face was bloody. 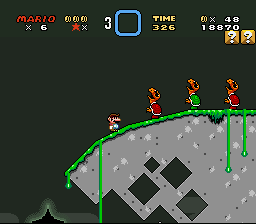 As I started playing the level it turned to a hidden cloud level and it looked like Mario had angel wings. A spooky digital voice came out of the Nintendo that sounded like it said "No hope". As I was about to grab a mushroom the screen went black. I reset the NES and the game came up. This time the title screen was different, and Mario's face was bloody. It scared me so much that I reset it again. As it came on the digital voice said "You can't run from the funk". The screen was hyper-realistic and it showed Mario again only this time his face was me and my family's face and we were skeletons. It was so realistic; I couldn't believe it. I was compelled to try the game again. This time I started it. As the first goomba walked towards Mario, Mario turned towards the screen and started screaming "NO MÁS, NO MÁS!" It sounded like high-quality CD-audio, also blast processing. I screamed and turned off the game. I put it away. Later that week I noticed my family acting distantly. I decided to research Mario games and I found out that Mario was in a secret game that was only released in two arcades on Friday the thirteenth on June 6th, 1997. It seemed weird so I started playing videogames again. I decided to put in the Mario game again. I loaded it up and I saw my save file. I clicked it and Mario said "Why-a you-a no-a stop-a playing-a my-a game-a" I didn't take his warning and I played anyway. I got up to Bowser and I won but when I got to Peach there was toad there instead and he said "Peach is dead". Then a ghost face came up and it had a ladies face and Princess Peach is a lady. Then my mom walked in and she screamed. I was dead the whole time and guess what: my name was Jim!!!!!!!!! So anyway I don't know if any of you guys have experienced anything like that. It might have just been a bad dream and anyway my mom sold the cartridge at a yard sale so I don't have it anymore, but you should believe it because it's true! I caught on at "old man." Something screamed cliche. uh, excuse me, but NES Mario didn't have saves, you're story sounds.....unlikely. [spoiler]much like you can't save yourself!!!!! That's one of the few creepypastas that I actually respect because it doesn't rely on any sort of supernatural boogeymen or highly implausible scare tactics, it's just a mysterious creepy game. Although the name isn't winning any awards. So Half-Life itself can be pretty scary at times. But They Hunger took the game and planted it firmly in horror territory. The mod (one of the first really popular ones for HL) features action/survival horror gameplay as you traverse a zombie-infested countryside. This mod plays a little differently than HL. Supplies are extremely scarce. The undead are everywhere, and there's not enough bullets to stop them all, so if you don't play smart, you're going to die. They Hunger also has an interesting cast of characters you meet as you attempt to discover what's causing the dead to rise. The game is set in the aftermath of Metroid Prime, and you play as Dark Samus during her rise to power. The setting, "Planet SR217," is even darker and more eerie than Zebes. The core mechanics of the game remain the same, although a lot of the weapons and items have been altered, and there are even a few new ones. It also includes new features such as containers that can be destroyed for health or ammo, and new door types. While the hard-coded enemy and boss behavior hasn't been changed, they've received altered appearances, strengths and weaknesses, and placement that make them interesting to encounter. 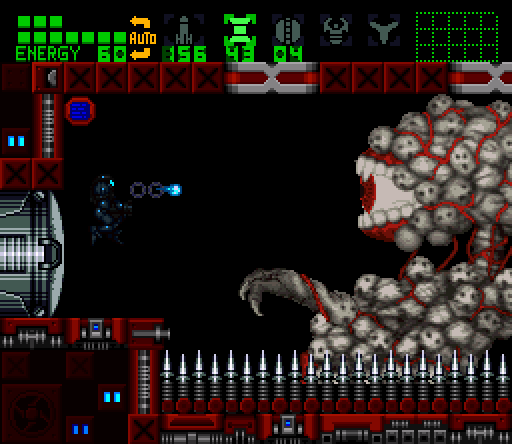 Although this hack is still fairly early in development, it's been praised as one of the best Super Metroid mods out there. The game's currently in version 0.3, and while very buggy in places can be played through to the end. You can download the hack and read more about it here. 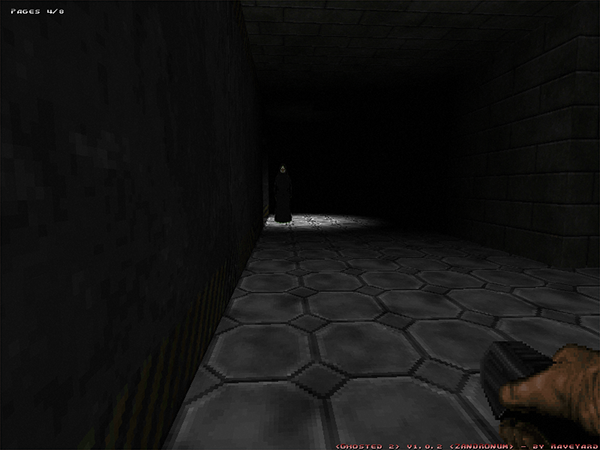 Ghosted was a Doom WAD released a few years back that aped the style and gameplay of Slender: you were placed in a dark building with only a flashlight and had to locate a number of pages while avoid deadly ghouls. Ghosted 2 updates the game to add a variety of locales (including abandoned apartments, hospitals, shipyards, crypts, archaeological sites, etc.) and ghosts (including Slenderman himself). I'm not a huge fan of "haunted Easter egg hunt" games, yet Ghosted 2 can be a blast to play simply because of the multiplayer aspect. Hunting for the missing pages becomes a lot of fun when you have to work together with a group of people that is constantly shrinking as the prowling specters home in on you. This video gives a pretty good feel of what the gameplay is like, but in this case it's only one player. This video shows off multiplayer, though for some reason the ambient lighting (which is important in a dark, creepy game like this) is turned off. The WAD is currently in version 1.0.3, and you can find download information here. You will need a Doom source port to play the WAD; I would recommend Zandronum. You can still occasionally catch public servers playing the WAD on Doomseeker, so hop in and join the fun if you do. Okay, so this one's a little different, since it isn't taking a normal game and making it creepy, but the other way around. 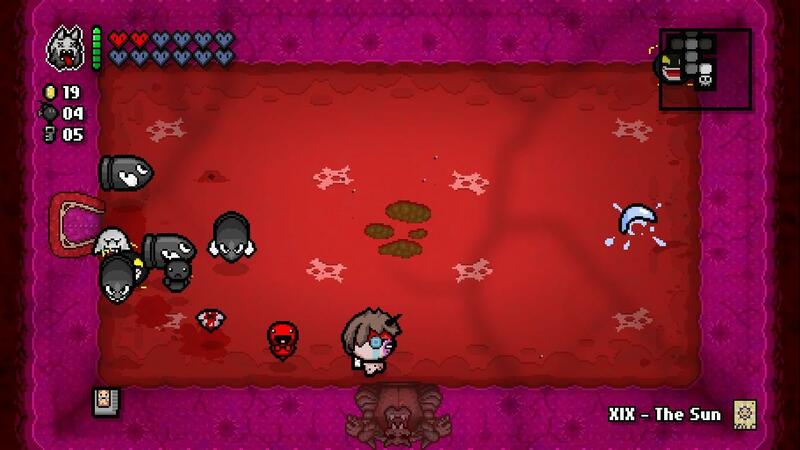 This mod allows you to play as a cute widdle Toad in The Binding of Isaac. It also replaces many of the game's enemies and items with ones from the Mario universe. Although much of the original game's graphics remain unaltered, this is changing as the mod develops further. The most recent release version is 1.0. You can peruse the development blog here (it also has a download link). The Binding of Toad sounds right up my alley. 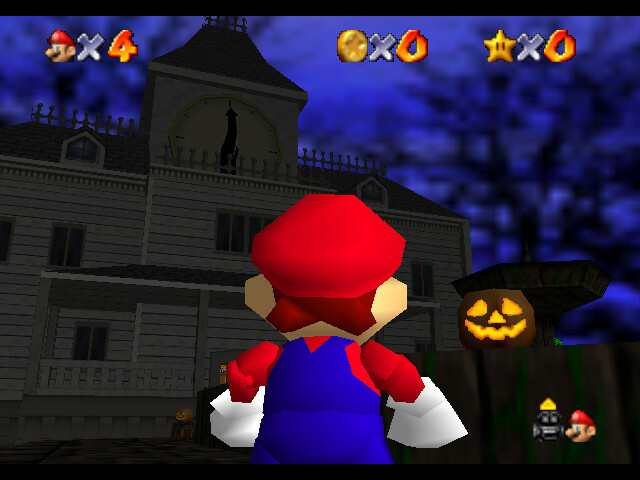 Super Mario 64 has a fairly active modding community, so it's no surprise that a Halloween hack has turned up. Halloween Mayhem is a fun little romp through a set of Halloween-themed worlds. It's fairly short (seven normal levels plus a bonus one, each with a single star), but the stages are challenging and varied. You'll visit a clock tower, an ancient Egyptian tomb, a giant cauldron of witch's brew, even a dark cavern where you have to ride a mine cart. Some of the enemies and obstacles look a little different, too. My favorite is the (adorable) Goomba vampires. You can grab yourself a download here. You will need a N64 emulator to play it. That's the SM64 I need. Halloween everything. A cosmetic Super Mario Bros. hack, which replaces the game's regular graphics with ghoulish ones. The bright, lush fields of the Mushroom Kingdom are now dark graveyards, enemies are now ghosts and skeletons, and Mario himself is a sad little bedsheet ghost. 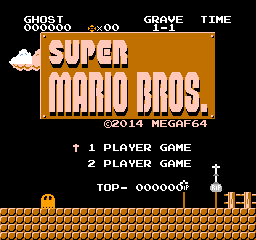 If you've ever wished SMB could be a little spookier, this might be worth a download. You can download the ROM here. You will need an NES emulator to play it. Released in 2008 by Toby Fox (yes, that Toby Fox), this is a Halloween-themed romhack of EarthBound. It features a new story, original music, and even some new graphics. It's noted for it's grim storyline as well as its... interesting sense of humor. It's almost like a proto-Undertale, particularly with its theme of player choice (or lack thereof) and moral actions in video games. Worth checking out, especially if you're a fan of both EarthBound and Undertale. You can download the hack here. Oh yes, I know about that romhack. Very cool stuff, I'll add. I have meant to play it sometime but as things go, I'm much more likely to play a romhack of something action-based than text-oriented, and I barely touch those.